William Franklin Noland was my father's maternal grandfather. That makes him one of my four great grandfathers. His father was Thomas Jefferson Noland and his mother was Parmelia "Mealy" Margaret Ridling. On February 11, 1775 a William Noland was born in Loudoun County, Virginia near Noland's Ferry. This was 166 years to the day before I was born and he could have been one of my 32 great, great, great, great grandfathers. On April 12, 1796 this William Noland married Catharine Callender of Carlisle, Pennsylvania. It is possible that the T.J. Noland, who died suddenly in 1857 in Memphis, Tennessee in 1857 was born after that marriage. 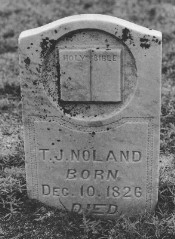 This T. J. Noland was the son of William Noland and Catharine Callender. If he was the father of the Thomas Jefferson Noland, who was born in 1826 in Tennessee, then these two additional Nolands are in the line of ancestory. A connection has not been established between these Nolands and the Nolands that follow. William Noland's father, Thomas Jefferson Noland was born December 10, 1826 in Tennessee (d. 9/1887 Lone Grove). William Noland's mother, Parmelia "Mealy" Margaret Ridling was born in Georgia (d. 1904 Lone Grove). TJ and Mealy probably got married in 1845 or early 1846 probably in Georgia. Their first child was a daughter, Missouri T. Noland. TJ and Mealy had a boy, Alfred, September 6, 1846 while in Georgia according to Leonard Noland's web site, but September 1847 in Alabama according to the 1900 Census. William Franklin Noland was born to Thomas and Mealy Noland. Sarah Matilda Beaty (future wife of William Noland) was born. James W. Brewer (future husband of William and Sarah's daughter Sidney Noland) was born August 22, 1878 according to his tombstone. The 1880 Census for Union Township shows a James W. Brewer who was 5 years old. He was the son of E.S. Brewer (45) and Sarah (36). 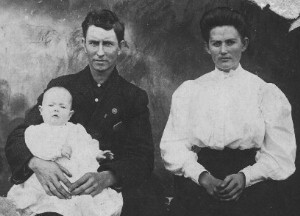 Siblings were Mary R. (16), William C. (9), and John N. (7). John Isaac Kissire (future second husband of William and Sarah's daughter Sidney Noland) was born July 24, 1885. William's father, Thomas Jefferson Noland died at the age of 60 and was buried at Lone Grove. Mealy was 59 and William was 27. Oldest son, Alfred, was about 40 years old. T.J.'s will (Teresa Brewer) indicates that there had been a rift between him and his three oldest children. This may have split the family. Mealy apprently went to live with Alfred by the time of the 1900 Census. William and Sarah's third daughter Mayola Josephine Noland was born on July 22, 1890. 1890 Census records burned. William died around January 1894 at the age of 34. He may have died of tuberculosis. He left Sarah a 32 year old widow pregnant with their fourth child and with three daughters of ages four, eleven and thirteen. Their fourth daughter, William Franklin Noland, was born April 5, 1894. Sarah named little Willie in honor of her late beloved husband. (F.M.K.C) My guess is that Sarah and her four daughters may have been in dire circumstances. Sarah may have been estranged from her husband's older, more posperous relatives because of the rift over the will. 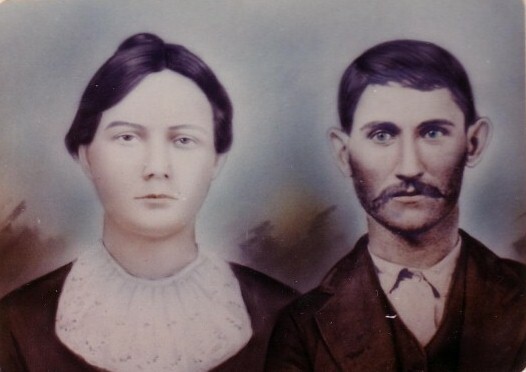 Daughter Nolar Ivy Noland (age 16 1/2), married Linus Clarence Roe (23) on April 3, 1897 in Conway County Arkansas. Linus apparently took in a new wife her three sisters and their mother. That must have been be a big load for a young husband of 23. However, that same year, daughter Sidney Noland (age almost 14) married James W. Brewer, son of Wesley Brewer and Matilda, September 7, 1897 in Conway County. This must have provided some relief to Nolar and Linus and the rest of the family. In March 1898 the first (1)grandchild of William and Sarah Noland, Georgia O. Roe was born to Nolar and Linus Roe. Grandmother Sarah died between 1897 and 1900 so it is possible that she did not see this grandchild. She was in her late 30's when she died. Mealy Noland, age 68, the grandmother of the Noland sisters, was a widow living with her son, Alfred age 52, in residence 123 in McLaren Township in Conway County Arkansas. Nolar age 19, the oldest Noland sister, was married to Linus Roe and they had a daughter, Georgia, who was two. 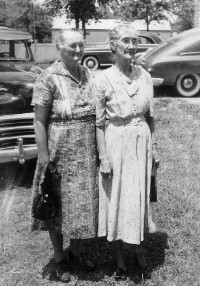 Nolar's sisters, Josephine and Willie (ages 9 and 6), were living with them. Sidney, the second Noland daughter, was also married although she was only 17 that year. Nolar and Sidney had been married for three years. The two younger Noland sisters, Josephine and Willie, were 9 and 6 respectively. Another (2) grandchild of William and Sarah, son of Nolar and Linus, Fred Roe was born after the 1900 Census. (3) Grandchild of William and Sarah, Sidney's first child, daughter Bessie Dean Brewer, was born January 26, 1903 (d. 6/15/55) Sidney was 19 years old. She had been married for five years. (Were there earlier pregnancies?) Also about this time Nolar and Linus produced another (4) granddaughter of William and Sarah Noland, Nona Roe. Around 1905 Nolar and Linus had a son named (5) Clyde who was the father of Rusty Roe. 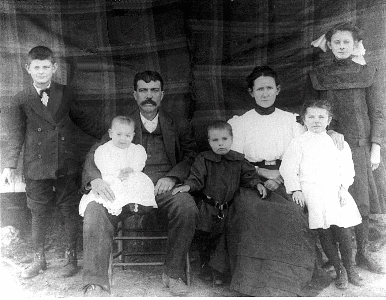 The Roe household consisted of Linus, 31; Nolar, 25; daughter Georgia, 7; son, Fred, 4; son, Clyde, baby; and Nolar's sisters: Jo, 14 and Willie, 11. Jo and Willie had to do the boys work on the farm (F.M.K.C.) and that may be one reason Jo got married at such a young age. As Georgia got older, she and Willie took up the farm chores. Willie described to her girls (F.M.K.C.) how she worked on the farm, even splitting rails for fences. (6) Grandchild, Sidney's second child, daughter Wilma James Brewer, was born December 27, 1907 (d. 9/1/90). This was also the year that Sidney's younger sister, Mayola Josephine Noland, married James Arthur Skipper in January (6/19/82 to 2/9/40). (7) Granddaughter of William and Sarah and first child of Jo and Jim, Thelma Skipper, was born in Lanty, Arkansas. Josephine was 18 when Thelma was born. (8) Grandchild of William and Sarah and fifth child of Nolar and Linus, Noland Roe was born March 6, 1909 (d.7/9/91). (9)Grandchild, Sidney's third child, son Albert Edward Brewer, was born August 23, 1909 (d. 8/21/84) Albert Brewer married Cletis Irene Patterson and Paul Brewer was one of his sons. Teresa is Paul's wife. W. Irving Skipper, son of Jim and Jo and (10) grandson of William and Sarah, was born in Lanty, Arkansas. Daughter Willie (18) married David Lindsey Krisell (1/24/1891 to 1/18/68) on July 3, 1912. This was about the year Sidney's first husband, James Brewer, died. Sidney was about 29 years old with three young children when she was widowed. Grandchild (12)Willie's first child, David Wilbourn Krisell 2/27/1915 to 11/11/1958. Grandchild (13), Sidney's fifth and final child, son William Jefferson (Jay) Kissire, was born February 17, 1917 (d.3/4/90). Sid was 43 when this child was born. Grandchild (14) Willie's second child, Florence Matilda Krisell Camp was born August 1, 1917. Pauline Skipper, daughter of Jim and Jo and grandchild (15) of William and Sarah Noland was born in England, Arkansas. Margarette Lavern Krisell Jackson was Willie's third child born October 31, 1919. She was grandchild (16). John Isaac Kissire, Sidney's second husband died March 26, 1922 in Conway County Arkansas. Sidney had been widowed twice by the time she was 39. Willie's seventh child, Betty Jo Krisell Dabbs, was born April 19, 1932. The year this grandchild (22) of William Franklin Noland and Sarah Matilda Beaty was born Nolar (Noland) Roe was 52, Sidney (Noland) Kissire was a widow at age 49, Josephine (Noland) Skipper was 42, and Willie was 38. I think this makes Betty Jo the youngest grandchild of the Noland's. A total of 22 grandchildren are listed here. Ivy Nolar Roe died December 27, 1941 at the age of 61. She was buried in the Mulberry Cemetery at England, Arkansas. Linus Clarence Roe died April 19, 1943 at the age of 69 and he was buried by Nolar in the Mulberry Cemetery. Sid and Willie at a reunion in 1951. 1860 - 1894?.....1862 - 1898? Clyde Roe Rusty Roe . Glenna Mae Roe . .
and John Isaac Kissire Bessie Dean Brewer . .
(1909- Margaret Louise Brewer . and James Arthur Skipper 1883 Thelma Skipper 1908 Virginia Edgeworth . James Arthur Skipper, Jr. 1921 - WWII James Maxwell Skipper 1941 James Maxwell Skipper, Jr.